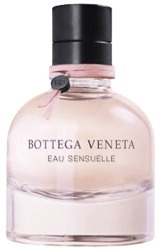 Bottega Veneta will launch Eau Sensuelle, a new fruity chypre fragrance for women. Eau Sensuelle was developed by perfumers Michel Almairac and Mylène Alran. The notes include bergamot, peach, gardenia, jasmine, pink pepper and leather accord. Bottega Veneta Eau Sensuelle will be available in 50 ml. I will update with concentration and other sizes when I can. Update ~ Eau Sensuelle is available in 30, 50 and 75 ml Eau de Parfum, and is a variation on the original Bottega Veneta fragrance. The description from Harvey Nichols: "Five years after the original Bottega Veneta fragrance comes Eau Sensuelle, a striking fruity floral leather chypre that suggests the suppleness and sensuality of the house’s renowned leather goods. A reinterpretation of the signature eau de parfum, the fragrance expresses an unexpected and softer side. An addition of fresh peach notes and a luxurious suede accord build upon the strength of the original leathery floral chypre with a unique, joyful twist." I’ll definitely try this. I love my BV bag and I’d like to branch out to their fragrances, but thus far none have moved me enough to buy a bottle. They are well done but too quiet for me. Bergamot, Peach, Gardenia, Jasmine, Leather… I’m Already There! Where do I buy!?!?! LOL!